Fall is best season to aerate your lawn. As summer is wrapping up, homeowners should turn their sites from the beaches to their lawns. This is because the best time to aerate, seed and fertilize is the fall season! Here is everything you need to know about aeration so you can enjoy some proper games of backyard football this season! In order to achieve lush, green grass during the fall months and next spring, you need to allow your lawn to breathe! The way you do this is through a process called aeration. When the ground becomes too dense to accept water, air and other nutrients, it needs to be perforated with small holes. By doing so, the grass roots will have a much easier time taking everything in to make your lawn thicker and increase the effectiveness of normal irrigation, fertilizers and pest control programs. 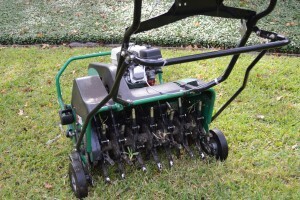 Spike Aerator– A machine that is used for poking the ground. It is generally a metal fork. Plug Aerator– A machine that removes cores of soil from the ground. If you want to achieve the best possible aeration results, opt for a plug core aeration machine. It is the better choice out of the two. The process of lawn aeration involves using a lawn core aeration power machine which is not easy to operate for most home owners. Also, you will need the correct grass seed blend and fertilizer. If you are not comfortable tackling this project, let the pros at JFK Landscape help you achieve the best-looking lawn in the neighborhood! After the lawn is aerated, you will notice small turf plugs and holes scattered throughout your lawn. In a few weeks, these plugs will eventually breakdown feeding nutrients back into the lawn. Afterwards, water your turf consistently to facilitate the new growth and rejuvenation of your lawn. This entry was posted on Tuesday, August 1st, 2017 at 4:04 pm. Both comments and pings are currently closed.